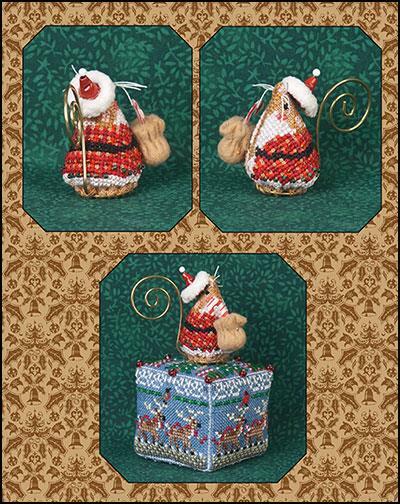 A limited edition in the mouse series from Just Nan called Gingerbread Santa Mouse. This cutey comes with the gold curly hanger tail, antique brass button for the base, crystal red & matte green beads, tan felt for bag, candy cane, Santa hat, white glass head pin. Design is 29H x 57W shown on 32 count Gingerbread Belfast linen from Picture This Plus or antique almond from Zweigart.